Join the discussion on our forums! Come discuss Darkest Hour over in our dedicated Darkest Hour discussion topic. This card is nuts. I mean, Bloodbloom is actually the card that's nuts, but boy is DH warlock strong and consistent! Game breaking especially in wild with blood bloom. This card is not for the imps decks; this is for the Big Warlock. So, if you have around 10 big minions in your deck, at some point you will play one, value trade and replace (“heal”) it with another minion in you deck with this card. 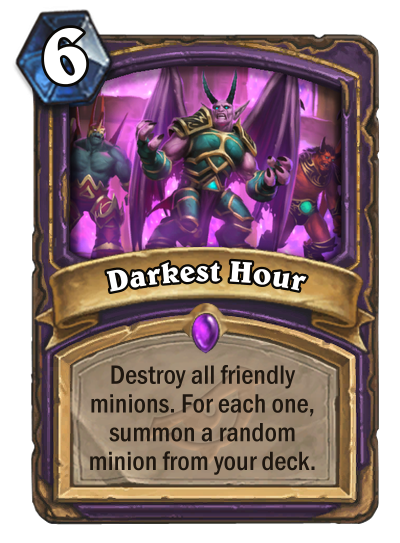 This card is 6-cost, so if minions in your deck cost more, it’s pretty good for you. Looks like, you minions should have decent Deathrattles to make it work. Dr. Morrigan is irreplaceable in this kind of decks. And you can combo it with Fiendish Circle. Still, in my opinion, it’s not worth it. You summon four big minions but at turn 10 your opponent already should have a big AoE. Note, this card summons not copies but the real minions — you might lose about 40% of your threats at once.